Voltron: Legendary Defender might be the best thing to happen to cartoons since The Legend of Korra. Now, that could be because it’s awesome, but it’s most likely because they share a common ancestry. From the producers of Avatar: The Last Airbender and The Legend of Korra, Voltron is another story of young people pulled out of their depth by cosmic events and the trials and tribulations that make them stronger, better people. Voltron is the animated equivalent of a marquee Netflix original, only this time, the other title card is the DreamWorks logo. This means that everything from the animation to the sound design is on point – and in a big space adventure full of giant robots and alien magic it darn well ought to be. Just like The Last Airbender and Korra before it, the animation in Voltron is so sophisticated that it delivers kinetic action sequences and moments of Disney-like mirth at the same time. The show really does offer the best of both worlds, which is apparent in its characters. At first glance, they’re a collection of clichés, but scratch the surface – and this first season is just a scratch – and there is so much more to them. There’s Shiro, the leader, a heroic space captain who is captured in the first scene by the Galra (the evil aliens), only to return in an alien capsule with a robotic arm. There’s Hunk, the big, hungry one, who, at the start, is more interested in food than fighting but, eventually, is shown to be the most courageous of them all. Pidge seems to be just a nerdy scientist/get out clause, but is far more than he seems. Lance is the over-confident hot shot, who is more Topper Harley than Maverick, but he has some poignant moments of sincerity and his interplay with disgraced but incredibly badass pilot Keith is a good laugh and has room for expansion. For those worrying that this isn’t a particularly gender diverse cast shouldn’t be too concerned, as the one female character, Princess Alura, more than makes up for the lack of ladies. She’s no push-over; base-jumping from orbit and commanding a huge battle cruiser ensures stereotypes are kicked squarely out the window. She’s also an engaging character because she’s made up of two parts; there’s the exasperated Princess Leia version, who gets a look in during most of the adventures and battles, but there’s also the home-sick young woman who emerges whenever she interacts with the virtual ghost of her dead father, who makes up part of her ship’s AI. S brave warrior/space-princess, who retreats into a virtual space to truly be herself, is something the lower end of the age demographic can surely relate to. Of course, Voltron’s character roster wouldn’t be complete without mentioning comedy outlet Coran, played by the unstoppable Ryhs Darby. Darby is clearly in his element here; while his highlights are mostly comedic, he’s also able to carry a sense of urgency when the Paladins (the guys who pilot Voltron) get into a jam. There are a few hints at a tragic past, too; like the rest, Coran’s a firmly three-dimensional character. Speaking of which, the integration of 3D models with cell animation is effortlessly slick. It’s most notable in the depiction of the five Robot Lions, who combine to form Voltron. This means that the show features some incredible action sequences that are part Pacific Rim and part Crouching Tiger, but in space. Whoever is the fight choreographer deserves a raise for their efforts; even when they’re not in their Lions, the Paladins are a pretty fearsome bunch thanks to the help of things called ‘Bayards’ (boomerang looking implements that morph into swords and guns). The fights that the characters have on foot are gorgeous, kinetic, technicolour ballets that would make people in The Raid jealous. Admittedly, it’s not as high stakes, because it’s a cartoon, but the cell animation and art direction is so wonderfully vivid that the motions of combat become a work of art. The show’s pacing is fairly even and it’s hard to pick a best episode – like many cartoon serials, the show doesn’t mess about building up to certain anchor moments. Instead, Voltron whips along, giving a good serving of exposition mixed in with healthy doses of bombastic action. There is also ample room to show off the world – the team visit a range of planets and areas of space that are beautifully realised, with an anthropological believability to the the races that inhabit them. Such attention to detail isn’t surprising from the people who worked on the Avatar saga, which has a burgeoning Wiki even now. Here’s hoping that Voltron will follow suit. Of course, it’s one thing that it looks the part, but Voltron also gets it right in the sound department. Lasers buzz, swords clang, spaceships hum and Robot Lions roar in a thrilling symphony of noise that would impress the folks at Skywalker Sound. Even the soundtrack is like John Williams’ orchestra, if they were converted into a collection of robots programmed by Blade Runner’s Vangelis. It’s all sci-fi electronica that erupts into frantic drums and strings – and the reason you’ll watch the opening titles over and over again. The accessible and prolific nature of streaming services means that children and teenagers aren’t just watching cartoons on Saturday mornings anymore. For every Breaking Bad or Daredevil, there should be five Voltrons. 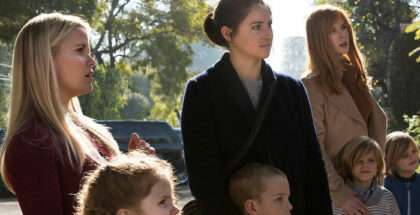 Younger audiences are far more clued-up than viewers in the 1980s and they deserve programming that doesn’t talk down to them and has been handled with care. 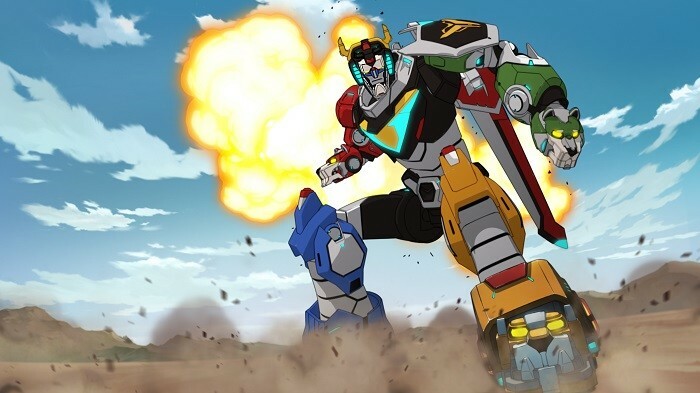 Voltron: Legendary Defender delivers that and then some: this a show that will fire the imagination of kids everywhere. Also, for a generation of new parents who have nurtured their inner child bolstered by neo-pop culture trends, this is the perfect way for them to enjoy something with their real child and not be bored out of their skulls by the content. Give us a Season 2 please. Voltron: Legendary Defender Season 1 and 2 are now available on Netflix UK, as part of a £7.99 monthly subscription.